Need a healthy dessert in a flash? 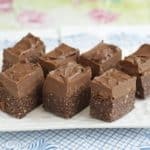 This Healthy Fudge Brownie Recipe is raw, paleo, and dairy free, and so good you'll have a hard time not finishing the whole pan! Line an 8.5 inch (21.5 cm) square pan with parchment paper. Set aside (for thicker brownies, recipe can be made in a loaf pan instead). In a food processor, process the walnuts, hazelnuts, coconut sugar, and salt until the mixture resembles coarse crumbs. Add the cacao powder, agave nectar, vanilla powder, and stevia and process until the mixture begins to come together in a ball. Stop and scrape the sides if necessary while processing. Take care not to over-process, or you just might end up with nut butter! The mixture should be moist enough to stick together when pinched, but not wet. Turn the brownie “dough” into the pan and press down firmly with hands or a stiff spatula so that the mixture is dense with no air bubbles. Place in the refrigerator while you prepare the fudge topping. Place the coconut butter, hazelnuts, cacao powder, coconut sugar and salt in a high-speed blender. Push the mixture toward the blades, using the tamper (or other blending mechanism) and blend until the mixture liquefies, about 5 minutes, stopping to scrape down the sides as needed. Add the vanilla extract and stevia. Blend again. Pour the mixture over the brownie dough in the pan. Return to the refrigerator until the fudge is set--about one hour. Using the parchment paper as a sling, pull out the brownie and place it on a cutting board. Cut into 1.-inch (4-cm) squares and store, covered, in the refrigerator until ready to serve. The no bake brownies keep covered, in the refrigerator, for up to 5 days. They may be frozen. Simply defrost, covered, in the refrigerator overnight.